Sleep tracking is all the rage, and not just in the monitoring, but also finding ways to actively improve our sleep. 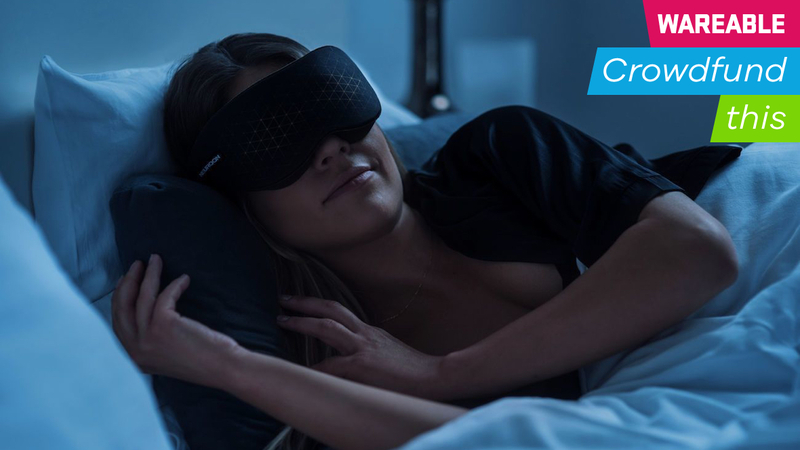 Neuroon Open is the latest to hit the scene, an open-source sleep tracking mask that both measures your sleep and helps you adjust your bedroom conditions to get optimal shut-eye. If the name already sounds familiar, that's because the original Neuroon launched in 2013, and Inteliclinic CEO/co-founder Kamil Adamczyk told Wareable that the company has sold around 10,000 units since. It's now turning focus to a second-generation wearable that builds on similar principles of helping users accurately track sleep, but now with the addition of features to also help improve it. "One of the biggest changes we made was making the project open source," said Adamczyk. By doing so, it's opening the door for users and tweakers to get Neuroon talking to other devices, while IFTTT integration is also supported. "Right now the communication is constant, which gives us much more options," said Adamczyk. "One of the features we're going to introduce is real time sleep analytics". This will let users trigger events. For example, our body thermoregulation isn't as efficient during deeper sleep, and when in REM the body goes into a paralyzed state where it can't shiver to warm up; it's at this point Neuroon could tell the thermostat to warm up a little. Or perhaps you like falling asleep to an audiobook - Neuroon could shut down the sound when it detects you've drifted off. So what about the accuracy itself? Neuroon uses an EEG (electroencephalogram), which tracks brain activity and is used in sleep labs. Adamczyk says about 60% of the tracking is done here, while the rest is taken from a combination of movement and heart rate variability data. "The first version of our algorithms was 65% accurate to clinical sleep staging," said Adamczyk, "but the current one is about 78% accurate." Inteliclinic tested against a Philips sleep scoring Somnolyzer and a Philips polysomnography and tweaked its algorithms to the point where Adamczyk is confident in Neuroon's accuracy. As he explained, and as we saw in a recent study from Fitbit validating its own sleep tracking tech, getting 100% accuracy is difficult as there's always going to be some disagreement between doctors. But tracking brain activity is a much better way of determining your sleep stages and relying on guestimates from movement. Neuroon Open also promises to help induce lucid dreaming using light, vibration and acoustics during REM. Adamczyk said that within a month Inteliclinic will embark on trials with the University of Essex, UK, for this particular aspect. We've seen other companies also claim to have technology to induce lucid dreaming - where the dreamer is aware of their dream state - but we've also seen skepticism about how effective LED stimulation can be at doing this. The mask will also come with guided mindfulness sessions to help with lucid dreaming and meditation, while the wake-up alarm will work by gradually filling the mask with light to simulate dawn, followed by gentle vibrations and audio. A question as old as time itself. The quality of our sleep is closely linked to our sleep hygeine, factors of our outside environment be it temperature, noise or other things that can have a negative impact on our hours of rest. So in that respect, Neuroon is tapping into something good here, and the fact it's open source gives it plenty of potential. The company has pedigree too, so we're confident that it's done its homework on the EEG side of things. For the meditation and lucid dream aspects, that remains to be seen. Adamczyk said that, of the money raised through Kickstarter, 60-70% will be spent on manufacturing, and the rest will go into improving the app and sleep stage algorithms before launch. Inteliclinic is aiming to get the first set of units out in December but having almost doubled its $100,000 at the time of writing, with 21 days left to go, it can't promise all of the masks will ship by year's end without scaling up production. It's great to see sleep tracking getting more serious and taking into account the importance of sleep hygeine. Inteliclinc plans to tweak its algorithms and software between now and launch, but right now it all looks promising and we'll certainly be wrapping one around our face at the first opportunity.